I LOVE Bottega Louie you can read my small review on the restaurant by clicking here. 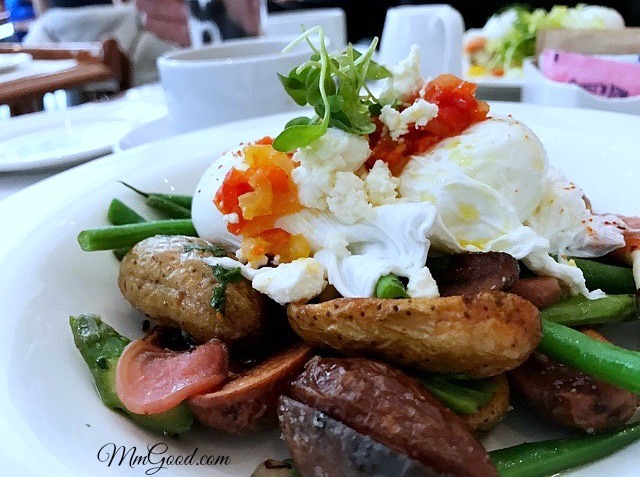 I had never been to Bottega Louie for breakfast so when I was invited to go for a quick breakfast before a football game, I jumped at the chance to try their breakfast. I was so happy I did as I ordered this fabulous inspiration of a breakfast. The photo above was my inspiration, they used snow peas, beets and roasted red/yellow bell pepper. 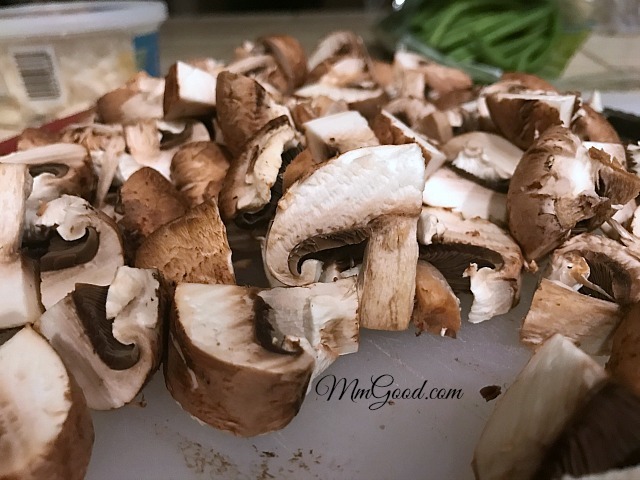 I changed the recipe to have tomatoes, mushrooms, and only roasted red pepper, so when you are making this recipe know that you can play around with the ingredients to make it to your likings. The only thing I wouldn’t change is poaching the eggs or if you are frying the eggs leave yolk, the yolk becomes your sauce to the dish (and I’m not a yolk lover and loved this). while the vegetables are roasted I cooked my string beans by placing them in hot water for 6-8 minutes so they were not over cooked. 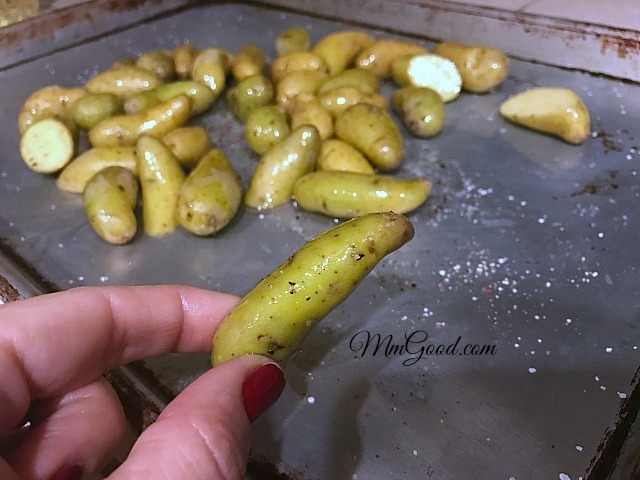 To make this recipe a little easier on you, you can roast the vegetables the day prior as well as blanching the string beans the day prior. 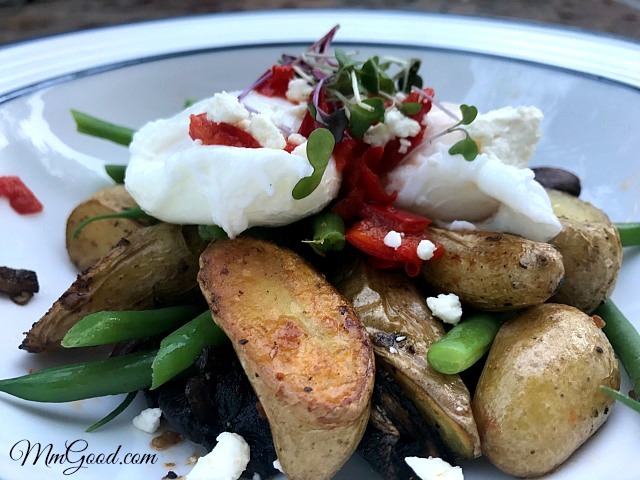 In the morning, while you are making the poached egg, put the vegetables in the oven or in a frying pan to warm them up and serve. I had a jar of roasted red peppers and I added the feta cheese, these are optional, if you wanted to make the dish look professional, some chopped parsley would be just fine. Preheat oven to 350 degrees. 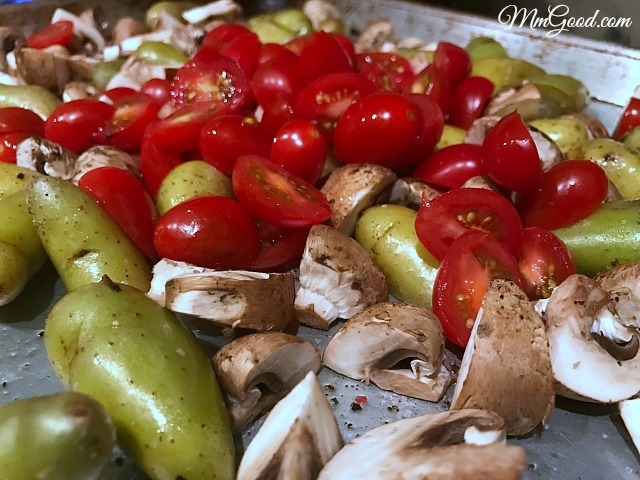 To a baking pan place potatoes, mushrooms, cherry tomatoes, olive oil, salt and pepper. 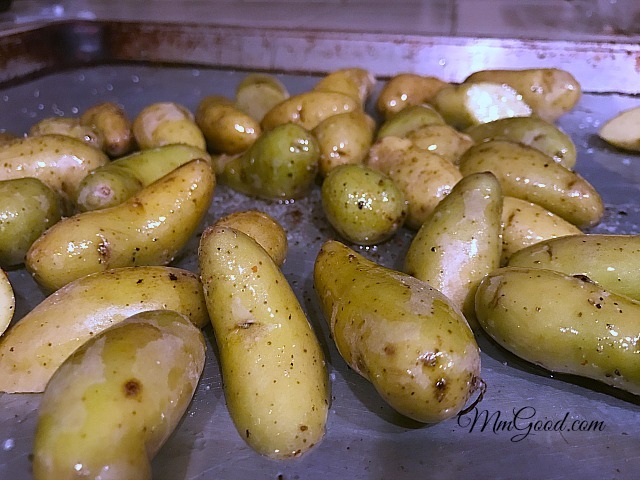 Bake for 25-30 minutes or until potatoes are completely cooked through. While the vegetables are roasting, blanch string beans: to blanch string beans bring a large pan of water to boil, add string beans and cook for 5-7 minutes (do not overcook), remove from water and place string beans in a large bowl of water with ice in it (this stops the beans from cooking). Remove from the water, place string beans on a paper towel to allow string beans dry. 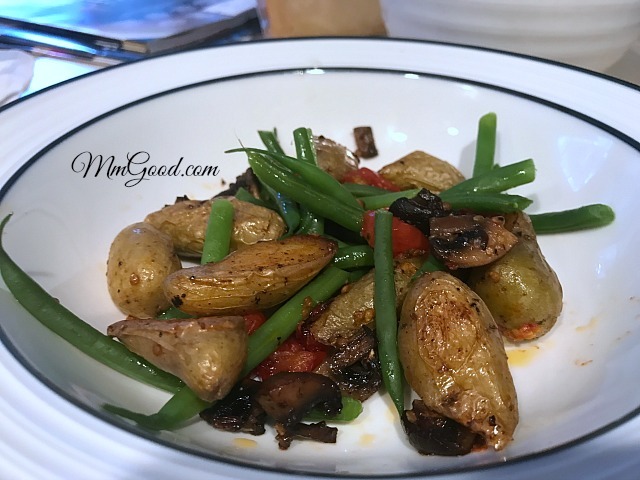 When dried add the string beans to the roasted vegetables. Place in a bowl and begin the poaching process. 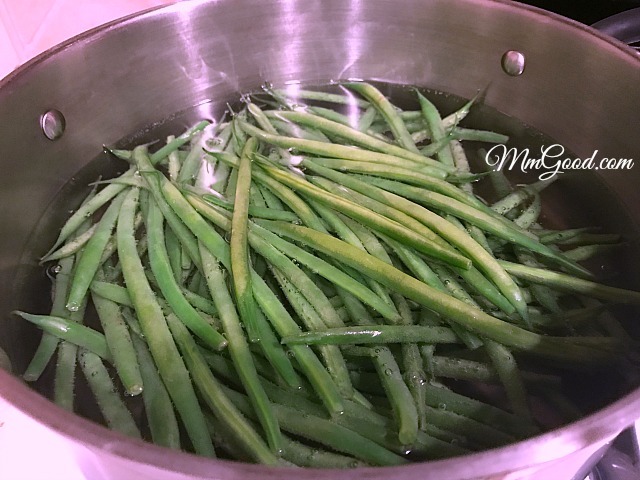 Once string beans are removed from the water, use the same water to blanch your eggs, to blanch your eggs, bring the water to a slight simmer, crack one egg at at a time and place in a small bowl, create a small whirlpool in the water (this helps the white of the egg to bind together). Add the egg into the water and let the egg cook for 3-4 minutes. Remove with a slotted spoon and place on top of the roasted vegetables. Optional - you can add a small amount of feta, chopped bell peppers or chopped parsley. Serve hot.